Some of the common causes of kidney failure in dogs are ingestion of toxins and tainted foods, decrease blood flow or delivery of oxygen to the kidneys, urinary obstruction or infections. While kidney problems are treatable with early intervention, chronic kidney disease may be a symptom of a bigger problem. This condition is much common in older dogs and may require more elaborate medical care. Whichever case, it is best to seek the help of a veterinarian who can prescribe appropriate treatment. As your dog recuperates, it is important that you give it the nourishment that its body needs. For this, most veterinarians recommend IAMS Veterinary Formula Renal Plus. 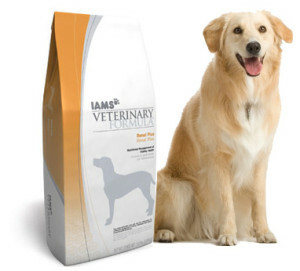 IAMS is a recognized brand in the production of a wide range of products for dogs with different health needs. It puts premium on the use of quality ingredients to provide nutritious and delectable foods for dogs of all ages and sizes. The IAMS Veterinary Formula Renal Plus is especially formulated to aid in renal disease management by providing ailing dogs with proper nutrition. Renal Plus was formulated with Nitrogen Trap Fiber System, naturally occurring in beet pulp, which increases the presence of good bacteria in the intestinal tract and aids in flushing nitrogenous wastes through the feces. Renal Plus has 50% more protein than other renal diets. It improves muscular mass and maintains body condition, immune system and organ function. Renal Plus contains targeted Omega 6:3 Fatty Acid ratio that reduces renal blood pressure thus supporting inflammation reduction. The reduced phosphorus levels in Renal Plus helps manage hyperphosphaternia and slows down the progression of renal disease. IAMS Veterinary Formula Renal Plus is made from choice ingredients especially made for dogs in aid of renal disease management. Fish Meal is a good source of Omega 3 Fatty Acids which keeps skin soft and supple and maintains good heart condition. Flax Meal is a great source of dietary fiber. It contains essential nutrients that give dogs with shinier coat, softer skin. It also provides protection against inflammation and aid in cell development. Potassium Citrate helps control the pH of the blood from becoming too acidic thus preventing the risk of bladder stone formation. Fructooligosaccharide contains prebiotics which support the growth of good bacteria in the large intestine and aid digestion. Unlike traditional renal diets, IAMS Veterinary Formula Renal Plus provides moderate protein levels that helps maintain glomerular filtration rate, strengthen its immune system and ensures proper organ function. Helping dogs recuperate from renal disease should be a top priority and you can rely on IAMS Veterinary Formula Renal Plus to provide your dog the right diet that will compliment your disease management protocol. Consult your veterinarian about the proper therapy plan for your dog and learn more about the nutritional benefits of IAMS Veterinary Formula Renal Plus. Get Iams dog food coupons can help you save a lot when you are buying IAMS for your dog friends.